The sentiment says 'Every Stitch comes from the heart' and is in Irish. There is an Irish word for stitch but when you use it in this sentence it means something all together different so the word stitch it is. Now, please be patient with me. I was up from 4 am last night as our carbon monoxide detector kept going off. We have a solid fuel range and would you believe it...four dogs sleeping in the kitchen and not one barked when it started beeping! We think the vents were blocked in the range so it is something we will have to keep an eye on. Anway, after I wrote this post I went for a lovely walk in our local bluebell woods and it kick started my brain a bit! I wonder, would anyone like to take part in a SAL? I am organised a stitching retreat in Ireland which will run from May 26th to the 29th. I thought it might be nice to run a virtual retreat and SAL over the same days, stitching the girly Irish Chart. Now with it featuring shamrocks, I would like to keep it Irish (gaelic) but I will also be releasing an English version. The reason it is in Irish is because I live in the West of Ireland where most people speak Irish, so it runs with the theme of the Irish Stitch Retreat. I will open a page on my blog for our virtual stitching retreat so we can share photos. I may also include a few small 'Irish' challenges as well, just over these four days! If you are interested and committed let me know and once I have names I will email out a pdf of the chart and we can all stitch it and finish it as we like. Just an idea, let me know if your interested! Right..off to do some real, material craft. Thank you for reading and feel free to leave a comment! You have just cheered me up enormously after a particularly stressful evening. I lose all the design, especially the flower one. I think I'd like to take part in your SAL but might be a bit pressed for time in the next few weeks - what did you have in mind? Ooohhhh...I love all of them. I would easily stitch Bea's garden for Colin...without the Bea obviously! I love it! The tea ones are lovely too but not I'm not a tea drinker! Now I adore the stitching ones as would love to join in the SAL but can't start before 22nd May as I really have to get my assignment done first. If that's not too late, then count me in!! Will you be doing an English version for it too or just the Irish one? All the designs are lovely! I am not a tea drinker, but could put coffee in for friends. I like the every stitch is from the heart; English version, and the girly version with shamrocks if I could get it in English. I would like to do the sal also. Thanks for sharing your wonderful designs with us!! Oooh! Love the Bee Garden! I may just have to stitch this up after the BBD SAL!! The cup of tea pattern is amazing too and I think my Irish Nana would love it :D Oh how I wish I could come and participate. I've always wanted to visit Ireland! Creative juices overfloweth again, lots of lovely things to see in this post. I would love to take part in your sal and I would like the Irish version. I live in the US but am of Irish decent so lots of Irish things in my house (including 2 red haired daughters with (as my mother said) "the map of Ireland on their faces". All are great ~ love the Bee's Garden!! 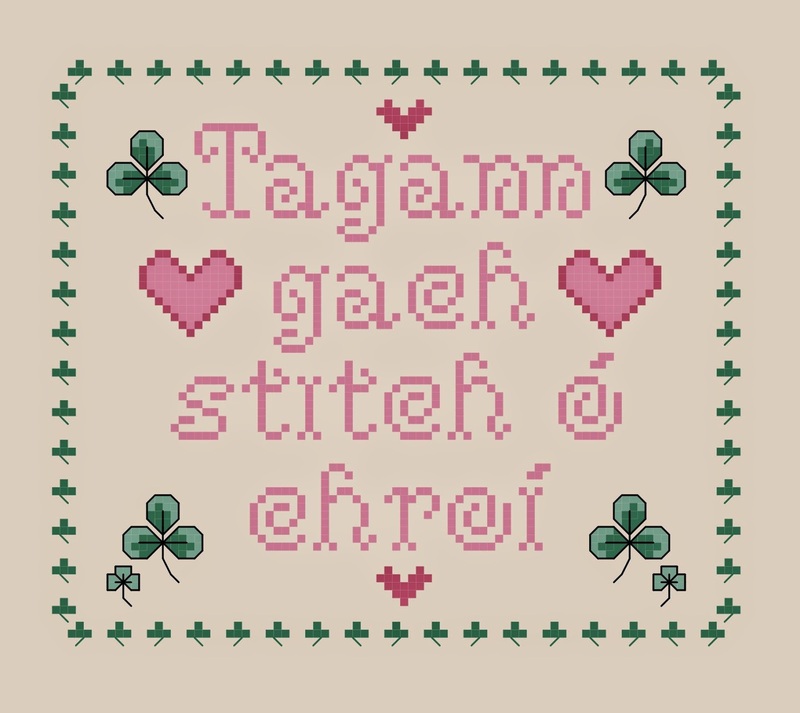 Count me in too, would love to stitch your Irish version. Wish i had a blog.. I am signed up aren't I? Are you going to run the 'real' retreat again? I would love to come to one! I would like to try the SAL. It sounds like fun and do-able since you aren't requiring a finish by the 29th. I do not have a blog. I'd like to try the Irish version since my paternal great-grandmother was Irish.Thanks.